Yesterday Samsung announced their latest Galaxy Note, and the phone is packed full of the following key sensors: Barometer, UV, Heart Rate Monitoring, SpO2 (Dependent on market), and more. Two of those stick out — SpO2 and UV. Having a pulse oximetry sensor (SpO2) in a phone would be tremendous, but with the “dependent on market” caveat we’ll have to wait and see. I suspect the “dependent on market” is secondary to concerns or considerations about FDA approval. The UV sensor is getting more of the attention. In order to use the UV sensor, you have to maintain a more than 60 degree elevation angle against the sun with the back of the sensor. Reports indicate Samsung will be using their S Health app to issue tips for sun exposure and sunscreen advice. So should the UV sensor actually be used to make sunscreen and sun exposure advice? Short answer — I wouldn’t want my patients using a UV sensor for that purpose. There is no need for a sensor to do this when the EPA reports the UV index on a daily basis. If a patient asked me about using the sensor, I would direct them to the EPA website, or, would recommend they use an Android app created by the EPA to help with this exact scenario. The Android app recognizes your location, and gives you all the information you need — directly from the EPA. In regards to wearing sunscreen, the American Academy of Dermatology has kept it simple. Use SPF of 30 or above, water resistent, broad spectrum coverage. Reapply every two hours when outdoors, and wear protective clothing. Apply one ounce, or enough to fill a shot glass — that’s a direct quote from the Academy. 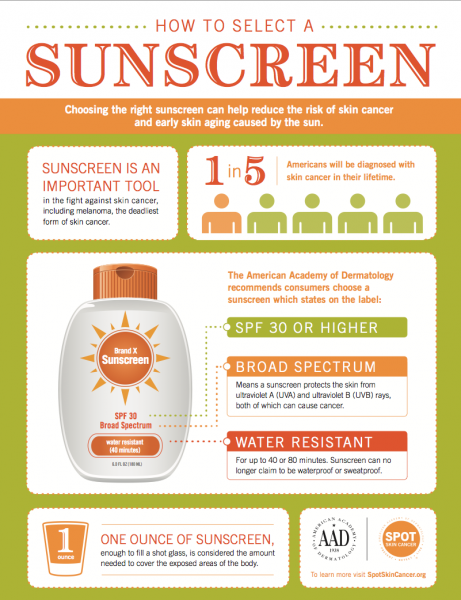 The American Academy of Dermatology has created a great Sunscreen FAQ, accompanied by an infographic that patient’s and doctors should use for guidance. Just because a sensor can be packaged with a phone or a wearable doesn’t mean it makes sense. We need to keep it simple — and not be titrating our sunscreen usage with a UV sensor on a phone.